We, or rather a group had to cancel a motorcycle trip that was scheduled for tomorrow. Every fall my Blue Knights Chapter plans an overnight trip to the Iron Horse Motorcycle Lodge & Resort in Stecoah, NC on their last weekend before closing for the season. Well, that weekend was supposed to begin tomorrow but Mother Nature really threw us a curve this year. You see, here in the southeastern U.S. we’re expecting back to back arctic cold fronts to come through. The first one has already passed and dropped temperatures to the mid 50’s (F) for highs here. As I type this it’s 49° F and overcast up at the Iron Horse. Tomorrow’s high temperature is now forecast to be 36° F! We were already prepared for cold weather and that wasn’t scaring us off. But the second front is bringing moisture with it. Tonight at the Iron Horse it’s supposed to begin raining and then after midnight that rain will be changing to snow. It’s now forecast to continue snowing in Stecoah until about 5:00 pm on Saturday afternoon. The National Weather Service isn’t saying it could change to snow but that it will change to snow. The Iron Horse is in a valley so they won’t be hit with as much snow as the slightly higher elevations but they’re still forecasting between 1 and 3 inches of snow in the valleys. That’s not exactly motorcycle friendly weather. There was an idea to ride up in cars but as we get closer to the Iron Horse, the roads are more rural and less traveled. The Iron Horse had also called our trip’s organizer concerned with the weather and guests travelling to them. So it looks like we’ll have to wait until at least the spring of 2015 to head back to the Iron Horse. Let Us Introduce You To….. Okay, I can’t keep the lid on it any longer. Let us introduce you to our new 2014 BMW R1200RT! When we arrived in Daytona Beach last week, our K1200LT suffered a failed outer bearing on the final drive of the motorcycle. BMW Motorcycles of Daytona was going to get us back on the road pretty quickly though. You can read the entry about the final drive here instead of me going into it again. We were at the dealer when we started to “What if…” ourselves. Many of you know what I mean. What if this happens or what if that happens? The K1200LT had 85, 391 miles on her when we retired her. Yes there were some maintenance items coming up due but that’s why it’s maintenance and hopefully not repair. I had just changed the oil before our trip to Florida. We were looking at an ebony black 2015 K1600GTL and what is now our quartz metallic blue 2014 R1200RT. To be honest, the more we looked, I couldn’t justify the extra money of the K1600. Besides the R1200RT is the boxer style engine. I really didn’t like the R1200RT in the black or the matte gray they had. But that’s just my choice. 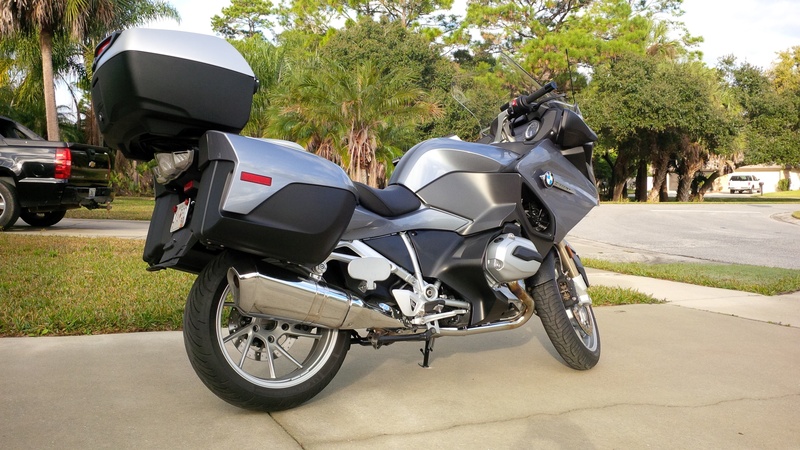 The R1200RT was pretty much outfitted with everything the K1600GTL had too! It has the Bluetooth audio and communications system, the heated seats and grips, cruise control, satellite radio, the ESA suspension system and so much more. Did I say it’s got a boxer style motor? As an incentive from BMW the purchase of the 2014 R1200RT came with the BMW Nav V GPS system. BMW of Daytona was out of the GPS so they needed to get it from their sister dealer in Orlando. It hadn’t arrived by the time we headed for home so they need to ship it this week. We went ahead and ordered the 49 liter top case, which they also didn’t have and will be shipped. It was a tougher decision to do this than we thought but we’re thinking it was a good one. We spent about half a day riding it around Daytona Beach during Biketoberfest while visiting my Dad. And then on Sunday we rode it home. The top case wasn’t in yet and this was the first time Donna would really be riding without a back rest or top case behind her for support. Luckily, we had done like we had in the past and made the trip home in 2 days after a stop overnight in Tifton, GA. It was really a good idea this time. Donna really wasn’t fond of not having the top case yet. And for me, after having the custom seat on the K1200LT the BMW seat on the R1200RT felt like sitting on a cinder block after a few hours. I’m sure I’ll adjust to the seat. The R1200RT gets tossed around by trucks more being that it’s more than 250 pounds lighter than the K1200LT was. We will miss the Magic Carpet, she served us well. In the coming weeks as we ride the R1200RT I’ll be posting more articles about it. She hasn’t been named yet but that will come soon. Greetings from Daytona Beach at Biketoberfest! But there was near disaster when we got here Wednesday. We got off the highway and immediately heard a sound coming from the motorcycle as it moved. It was sort of a “wuuu wuuu” as we rolled along. We got to my Dad’s house and parked the Magic Carpet in the garage for the night. The next morning I looked at the motorcycle and checked it more thoroughly. I found the sound was coming from the rear and the right side, the same side as the final drive. This could be real trouble. I called my local dealer back home, BMW Motorcycles of Atlanta for technical help. The technician said it sounded like a final drive or drive shaft problem. He also said to not drive it home because if that were the issue the rear end could fail or even lock up. He even recommended taking the Magic Carpet to BMW Motorcycles of Daytona and that they had a good service department. We got great customer service from Huel and BMW of Daytona. But, I’m typing this on a tablet and will finish it up later with a trip report when we get home as scheduled. My birthday was this past weekend. How did we celebrate you ask? Well, we went on a motorcycle trip of course. 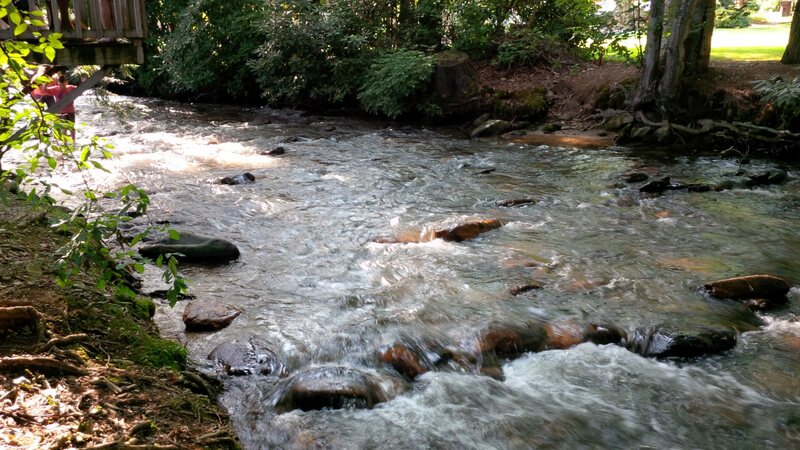 We decided that we’d ride up to Maggie Valley, NC and spend two nights at The Jonathan Creek Inn. We’ve stayed there on group trips before but this was our first solo stay there. We stayed in Maggie Valley nearly three years ago on our Blue Ridge Parkway “End To End” trip but didn’t stay at Jonathan Creek. So we left out late Saturday morning with half a tank of gas and headed for North Carolina. 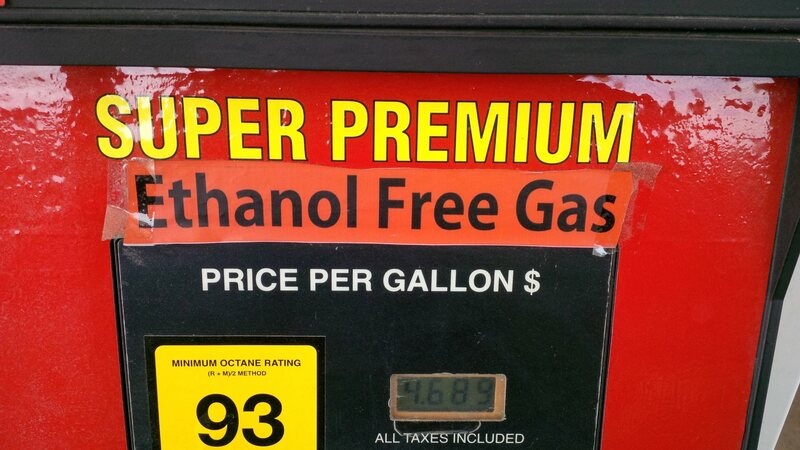 We got a nice surprise at a gas stop in Blue Ridge, Georgia when I found that the premium unleaded gas was ethanol free! After gassing up and showing some kids from Florida the motorcycle we continued on. Within two hours of being on the road we had been in three states; Georgia, Tennessee and North Carolina. We went up going through, Blue Ridge to McCaysville in Georgia and then Copperhill in Tennessee. 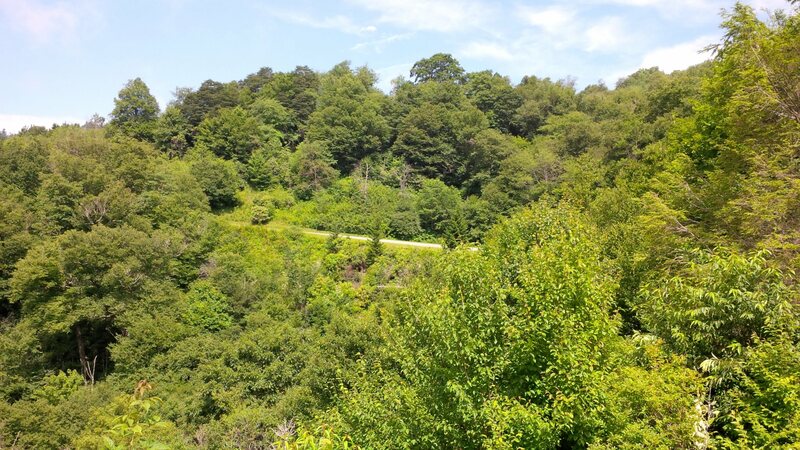 Once in North Carolina we headed for Andrews, Murphy, Topton, through the Nantahala Gorge into Cherokee and then on into Maggie Valley. The trip is about three and half hours of riding for us. The Jonathan Creek Inn gets its name because the Jonathan Creek runs behind the motel. Some of the rooms have a rear door that goes out to the creek or a screened in porch or patio. There was couple staying there that made home-made ice cream with fresh-cut peaches for anyone who wanted it. Yep, they did it just to do it. 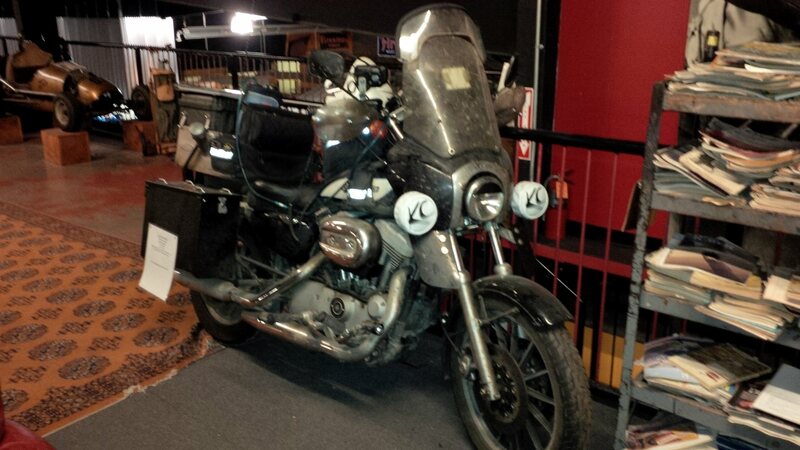 They rode this Kawasaki Vulcan down from Wisconsin to North Carolina. They were leaving for home when they posed for this picture. roads in and around The Great Smoky Mountain National Park. He said he and his wife were from “mid Wisconsin” and they didn’t have roads like that back home. He and his wife were riding his Kawasaki Vulcan. A few minutes later she showed up with their helmets and he said they were ready to go. I asked him where they were headed and he said “Home.” That’s right, they rode that Vulcan with soft saddlebags for luggage down from Wisconsin! They said they were going to try to make Indianapolis that night! They ride for about two hours before taking a break and set a destination and ride until they get there, be it 5 in the afternoon or 9 at night. Now that’s a motorcycling couple! My hat is off to them! Or should I say my helmet is off to them? After our breakfast we headed up and got on the Blue Ridge Parkway at about mile marker 26 and were going to ride to mile marker 0 down at Cherokee, NC. We were gaining in altitude the first part of the ride and within the first 10 miles the temperature dropped from 85°F to 69°F! The road is just as fun as I remember it and there was almost no traffic on the Parkway. We had the nice curvy road almost all to ourselves. It seemed like we could almost reach out and touch the clouds. After lunch in we did decide to drop in at the Wheels Through Time museum. I’ve heard so much about this museum and was told it was a “must see”. Personally I was quite disappointed. First off it’s not just motorcycles of any kind, but only American motorcycles. Yes there were some interesting things to see but there didn’t seem to be any order to it. You didn’t follow a timeline, it was more haphazard and you had no way of telling what a lot of the stuff was. I mean you could look and say, “Oh that’s a V-twin, you can’t read what it is but I bet it’s a Harley or an Indian.” Plus it was hot inside too. Now there was an interesting Harley Davidson upstairs that if you took a quick glance at some angles you might thing it was a BMW GS series motorcycle. 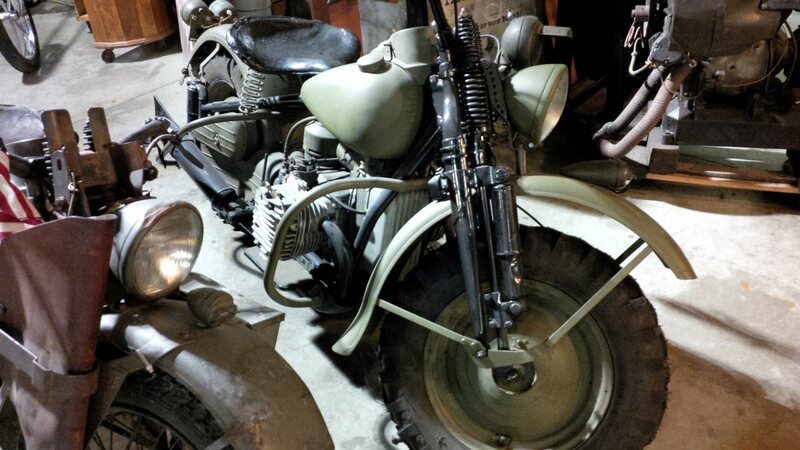 There was a WWII display that had a Harley Davidson that was quite apparently a Harley/BMW hybrid. Most of the parts said Harley Davidson but that sure was an old boxer twin and a shaft drive put in that Harley frame somehow. I thought it was quite a display of ingenuity in using what you could scrounge. I wondered if it was American mechanics who scrounged the BMW parts or German mechanics that scrounged the Harley parts. 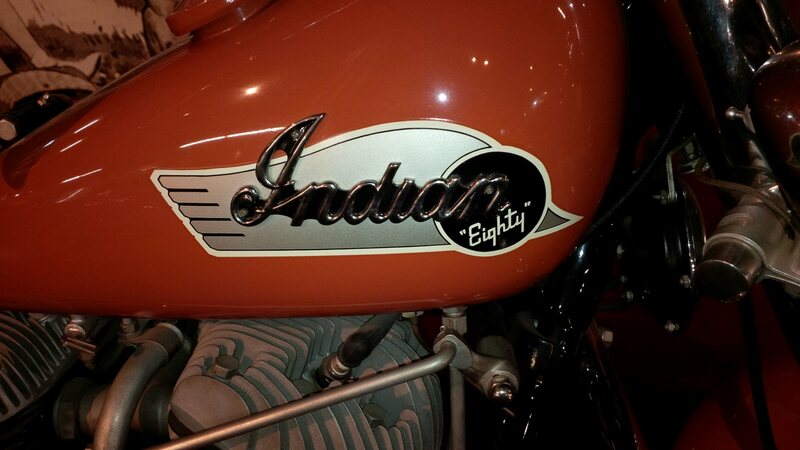 But the place really didn’t tell you the history of the American motorcycle. I felt like I was going to run into the guys from American Pickers at any minute. Sunday was also the day that a guy showed up with a Harley on a trailer, unloaded it, and then parked his motorcycle, the trailer and his SUV all in their own spaces. Yes he took up 3 spaces in a hotel that had limited parking already. We thought it was funny how some of the Harley riders at the hotel, you know the ones who rode their motorcycles, were talking about that guy. For dinner that night we decided to try a BBQ restaurant called Butts On The Creek. Take our advice and if you’re ever in Maggie Valley, don’t bother with it. It was probably the blandest BBQ pork I’ve ever had. It was gray and flavorless. There was no smoke flavor or BBQ flavor to it at all. After some pretty bad storms on Sunday night we woke up on Monday morning to clear skies and it was time for use to head home. After a hardy breakfast we loaded the Magic Carpet and said goodbye to Maggie Valley and were back home by early afternoon. Oh we did stop in Jasper, GA for a nice BBQ lunch though. It even looked and tasted like BBQ! An unexpected birthday surprise! Ethanol free gas in Blue Ridge, GA! Jonathan Creek behind the hotel. Jonathan Creek behind the Jonathan Creek Inn. 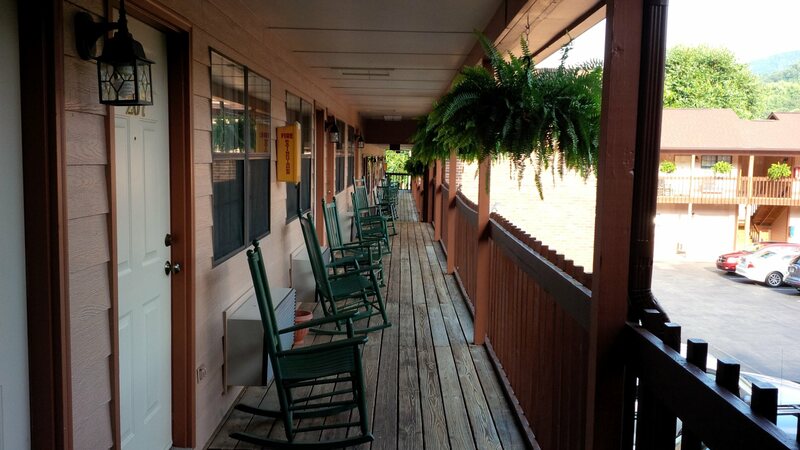 All these rooms on the left have a back door to creek or a patio overlooking the creek. 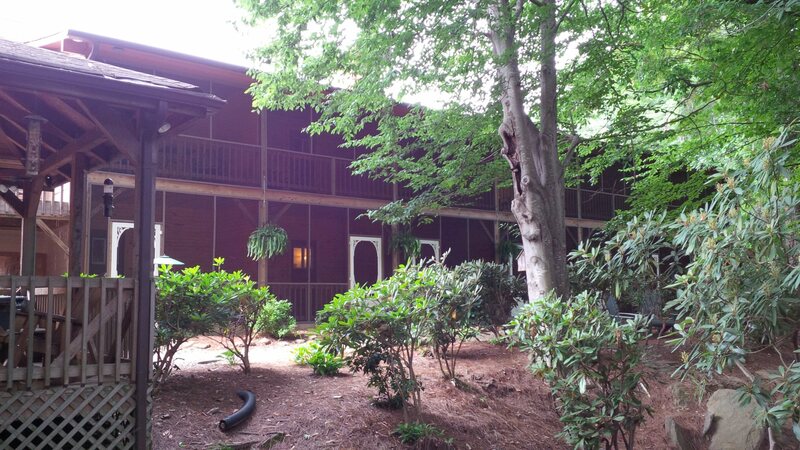 The back of the Jonathan Creek Inn. Looking from the creek. 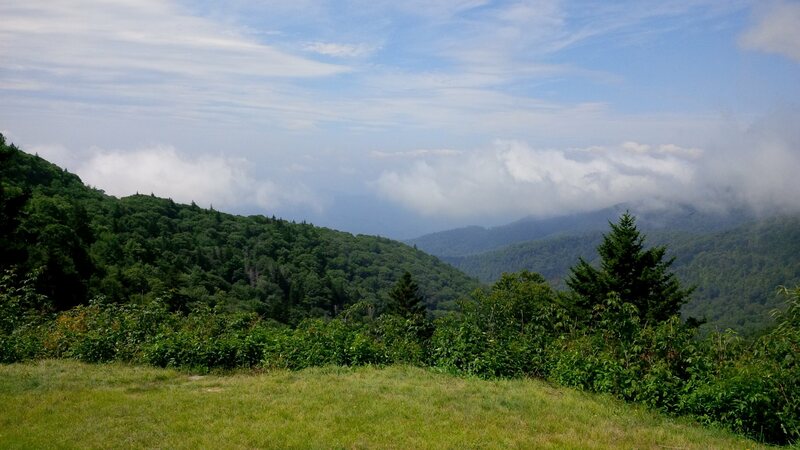 A view from the Blue Ridge Parkway. A view along the Blue Ridge Parkway. Along the Blue Ridge Parkway. That’s the Parkway in the center. Is this a Harley dual-sport? Yes, this is a Harley Davidson and not a BMW GS. 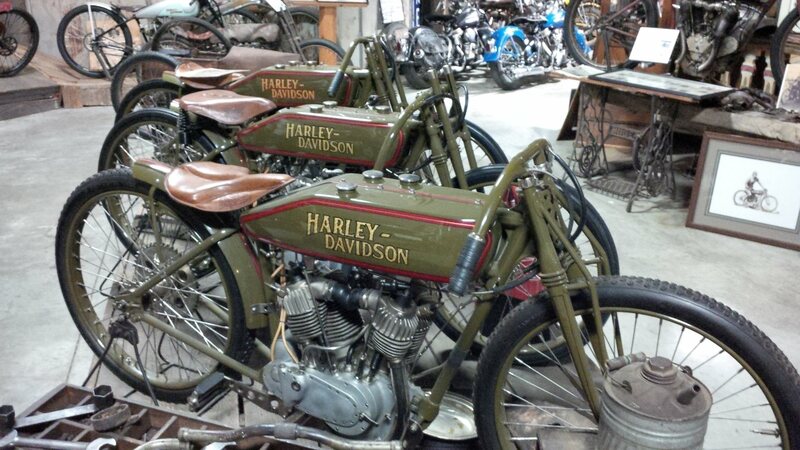 A trio of very old Harley Davidsons. Last Sunday I headed down on a solo trip to Florida to visit my Dad in the Daytona Beach area. It’s a trip that’s made a couple of times a year. The route isn’t anything spectacular as the whole idea is to get there. As you can imagine it’s all interstate highways to get there (although we have an alternate or two) going down I-75 to I-10, around Jacksonville on I-295 (believe me, you want to go around Jacksonville and not through) and then I-95 to my destination. See, I told you it was an interesting route. Departure is usually early in the morning letting me (or us) arrive in the afternoon. This trip was a little different and I left late in the morning so I’d get there in the very early evening (when I’m solo I can travel much quicker and take shorter stops). I forget how hot south-central Georgia can be once you get south of Macon! In southern Georgia I was motoring along in the center lane with the cruise control set just above 70 mph. In the right lane there was an SUV pulling an open trailer and I was slowly gaining on them. As I got closer I could see some children’s bicycles on the trailer along with what looked like some waterproof boxes. And then I saw it. There was a BMW R1200GSA travelling on down the road on the trailer! I slowly pulled alongside and adjusted the cruise control to match his speed. The driver saw me and energetically waved at me. I waved back. Then, I pointed to the motorcycle shaking my head and waving my finger in “no no” fashion like a parent would to a child. He burst out laughing! Then he shrugged his shoulders and pointed to his wife (I’m assuming) in the passenger seat, as if to say “It was her idea!” I motioned again and she started laughing too. It was kind of fun. I had hoped I’d run into them at a gas stop or rest area so I could tell him something like “I was going to call 911 when I saw a BMW on a trailer because I thought it was stolen.” or “I knew Harley Davidson was coming out with 2 new models but I didn’t know they looked like an R1200GSA.” In all fairness to this family they had Canadian license plates so it would’ve been a long family ride. But, his wife does get major points for letting him bring the motorcycle along. The rest of the trip went pretty much according to plan until I got to the Jacksonville area. The skies ahead were darkening and I knew rain was coming. I went ahead and stopped for my last gas stop on the way. After gassing up I checked the weather radar and saw storms on a map that was only 2 minutes old. But knowing the area and seeing the map I felt confident that by getting on I-295 very shortly and then heading south that I’d miss the storms. Well Murphy’s Law took over. It wasn’t long down the road when the bottom fell out with one of those good old-fashioned Florida summer thunderstorms. I was wearing a mesh jacket and my Tourmaster mesh pants. Did you know that rain goes right through mesh gear just like wind does? In no time I was soaked and there was no overpass around to duck under which to put rain gear on so I motored on. The thunderstorm lasted only about 10 minutes and then I was riding on dry road again. But I also found out that mesh riding gear also dries off really quick too. I had 2 more bouts with the rain once I got on I-95. After the second thundershower I just left the rain pants on and left the rain liner in the mesh jacket. I did get pretty warm. That last hour and half or so was the worst part of the trip and got me to my Dad’s much later than expected. Once there it was the typical visiting my Dad. I always knew that my Dad had originally enlisted in the Marine Corps at 15 years old during WWII and was sent home when it was discovered. One rainy day over lunch on the water, and a beer in my Dad, I got the full story. It was the summer of 1945 and he was 15 years old and falsified his age to join the Marines. The Drill Instructors had been coming in since the beginning and telling them that if they were not old enough to be there to step forward. The Boots (recruits) would even be pushed onto to bunks or onto the floor. They were several weeks into Boot Camp and he figured they were on to him. So when they said to step forward if you weren’t old enough, he did, along with a guy across the aisle too. They were both ushered off and interviewed separately by the Drill Instructor. My Dad said the Drill Instructor asked him what he wanted to do and what he thought should be done to him. He said the demeanor was now different, apparently since he now knew he was speaking with a 15-year-old boy. My Dad said they were halfway through with Boot Camp and he felt he had a duty to complete it. He was sent out to rejoin his platoon and complete Boot Camp and wasn’t treated any different from anyone else. He said that Parris Island was packed with Marines who had already completed Boot Camp and were continuing their training right there while they were living in “tent cities” while the Boots were in barracks. One day the platoon was gathered and they were told that a “secret bomb” had been dropped on Japan, that the one bomb had leveled an entire city and it was hoped it would end the war. It was years later when he learned that after Boot Camp that their training was for the invasion of the home island of Japan. There were told only it would be the fiercest fighting ever faced by the Marines or the Army. They continued to train. Japan surrendered and they continued to train. My Dad graduated Boot Camp and turned 16 years old at Parris Island. It was October when he was summoned to the Company Commander. He was told that a relative had written a letter, presumably to a Congressman or Senator that he was too young to enlist. The war was now over and he was being given a General Discharge under “Honorable Circumstances” with the reason for the discharge being a Falsified Enlistment. The Honorable Circumstances meant that he could re-enlist when he was old enough, which he later did. That lunchtime conversation made the entire trip worth while. “The Loop” in the Daytona Beach area. A few days later I rode “The Loop”, a short ride that begins in Ormond Beach and goes along the Halifax River and then through two state parks. Once in the parks you ride though some beautiful marsh land. 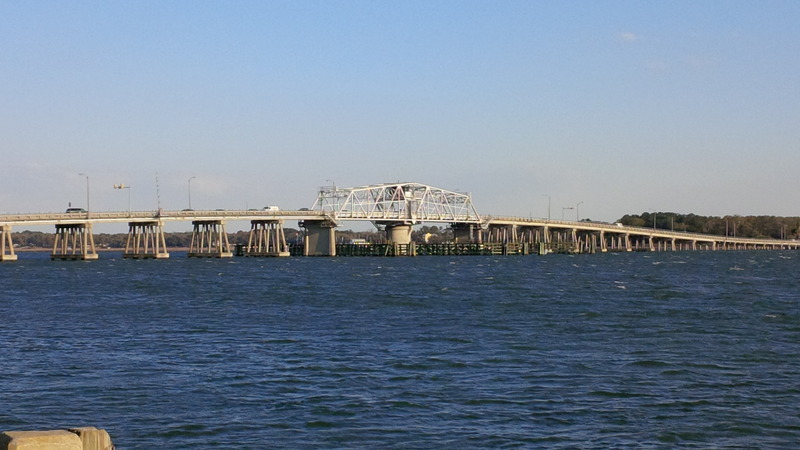 A portion of the ride is on the thin strip of land between the Halifax River and the Atlantic Ocean. You’ll ride with very large and expensive homes on one side of the street and cinder block bungalows on the other. As you right between those houses the road is covered by the branches of trees. I suppose you could ride along the stretch of Highway A1A along the beach that parallels the river side, but you’ve already ridden along the beach to get there. No beach riding on this ride. Portions of the ride make you feel like you’re in a remote wilderness. The ride gets its name from beginning and ending at the same intersection, hence “The Loop”. Oh, and the trip wouldn’t have been complete without a trip to BMW Motorcycles of Daytona! I had planned on leaving late in the morning on Friday as I had done to get there. My hope was to come through Atlanta after rush hour. My Dad then figured that it was Friday and if it rained in Atlanta I may not miss rush hour. So it was decided that I should be on the road by 6:30 am. I was on the road at 6:20 am. And as luck would have it, I got stuck behind a large crash on I-75 approaching Atlanta. I took me well over 30 minutes to travel 2 miles. That extra time put me going right though Atlanta at the beginning of a Friday afternoon rush hour. My Dad’s idea would have had me at home before rush hour even began. Oh well. I made it back home to Donna and the dogs. 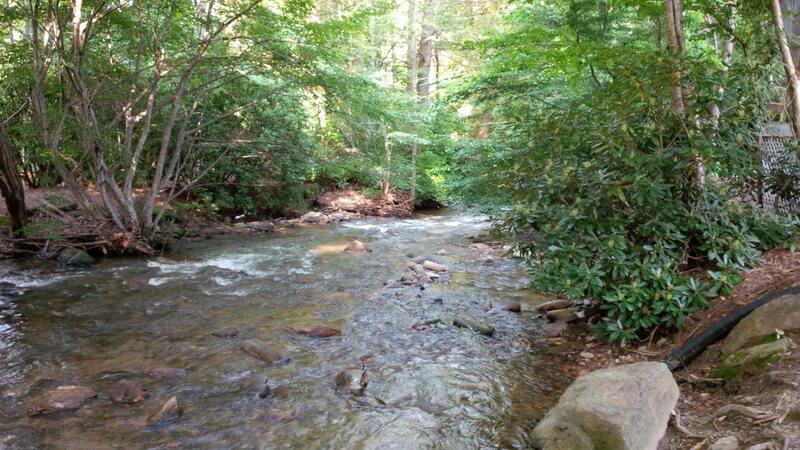 Now we’ll be getting ready for trip that Donna and I will be taking next weekend to Maggie Valley, NC. We don’t know yet if we’ll ride some on the Blue Ridge Parkway or if we’ll go to the Wheels Through Time motorcycle museum. We took a short vacation on the motorcycle that took us through three states and through one of the states three times. We left Georgia for our first destination in South Carolina where we stayed for two days. Then we left South Carolina going through Georgia to head for our next destination in Florida for a few days. Then we finally left Florida to head back into Georgia. This time the Magic Carpet was our transportation to our destinations. Once we arrived there were no plans to ride anywhere. The bike got us from to each point on the leg. At least it’s more fun than a car! On the first day we left home in Georgia for our first stop in Beaufort, SC in the Low Country. 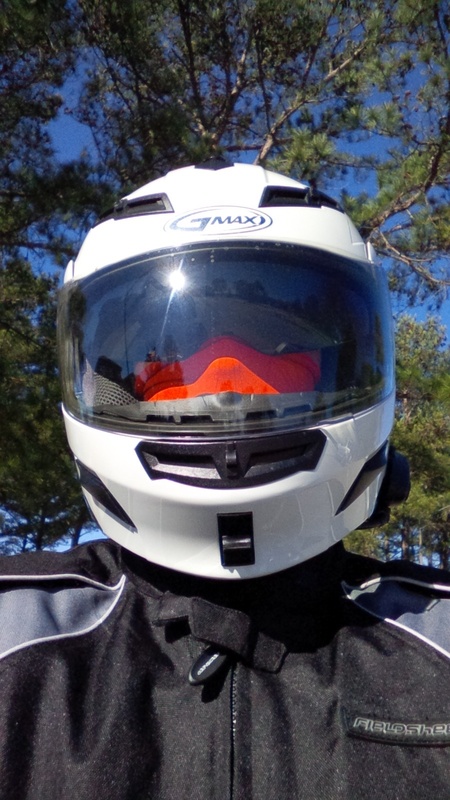 About half our ride was along Interstate 20 East heading from the Atlanta, GA area to the Augusta, GA area. The forecast called for a distinct chance of rain showers for that part of the route but we were very lucky to get just a few drops of rain on the windshield a couple of times. It did look ominous for a while when the sky ahead turned dark and cars approaching on the other side of the highway all had their headlights on but somehow we dodged the rain. The temperature stayed in the mid 50’s° (F) the entire day, forcing us to keep the liners in our jackets. After lunch in Augusta it was just a short hop over the border into South Carolina to get off the highway in North Augusta, South Carolina. We were now ready to head south-east on SC HWY 125 which is also known as Atomic RD. You see, SC125 goes through part of the Savannah River Plant. The Savannah River Plant is a nuclear plant but it’s purpose is not power generation but making things that go BOOM. The stretch of SC 125 that meanders through part of the plant is a two lane stretch of about 25-30 miles through forest and has no intersections. There are a few plant entrances but no intersections. While we didn’t see any 8 foot tall grasshoppers we did see a few streams with warning signs that said “Caution: Stream Temperature May Change Rapidly”. The fence lining the highway had the nice government “No Trespassing” signs. There were plenty of signs telling us not to stop except for an emergency. I found it amusing to see a sign about a historical marker a half mile ahead and sign under it commanding “No Stopping”. After the plant it was time to head for US HWY 278 and some of the small rural towns of South Carolina. It wasn’t long before Interstate 95 came into view but we were going to go under it and keep going. As we got deeper in the Low Country we could notice small fields of water and marshes along the road. Even while still a good distance inland, these marshes were controlled by the tides. It was also starting to get very windy while the sky was clearing. Live oaks with Spanish Moss began to form a canopy over the road. It wasn’t long before we were in Beaufort and checking in at the Best Western Sea Island Inn on Bay ST. Beaufort is a low country town very near the coast and is situated nearly equally from Charleston, SC as it is from Savannah, GA. It is also the county seat for Beaufort County. The town is loaded with ante-bellum homes built in the mid 1800’s. If you want to buy one, a small one could start at $750,000. 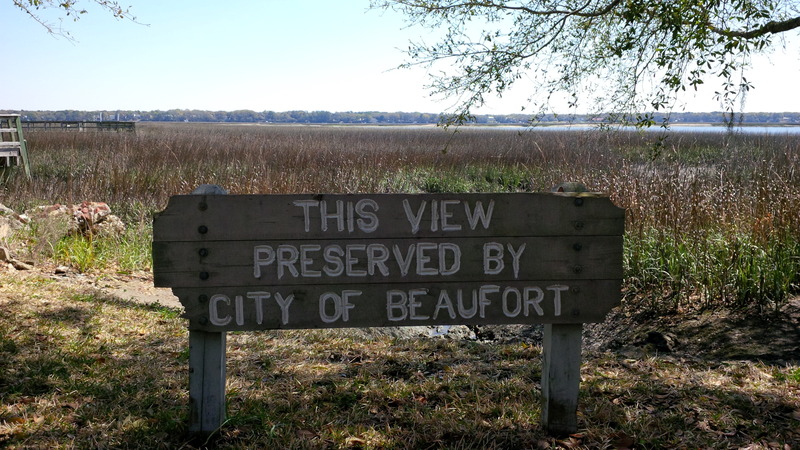 We’ve learned that Beaufort was also an area were freed slaves were allowed to settle before the Civil War. The freed slaves could own businesses, buy property and had their own bank and churches. If you consider that this was South Carolina before the Civil War it was actually pretty amazing. The Magic Carpet stayed parked and resting during our two-day stay. 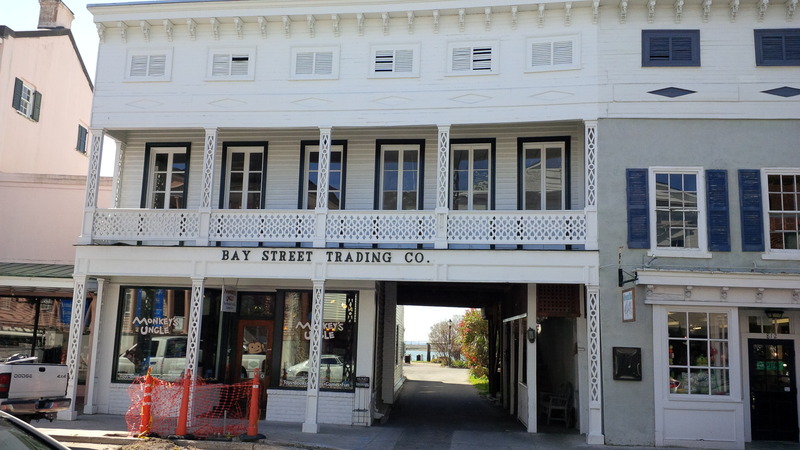 Everything we wanted to do or see was right along Bay ST and a short walking distance. 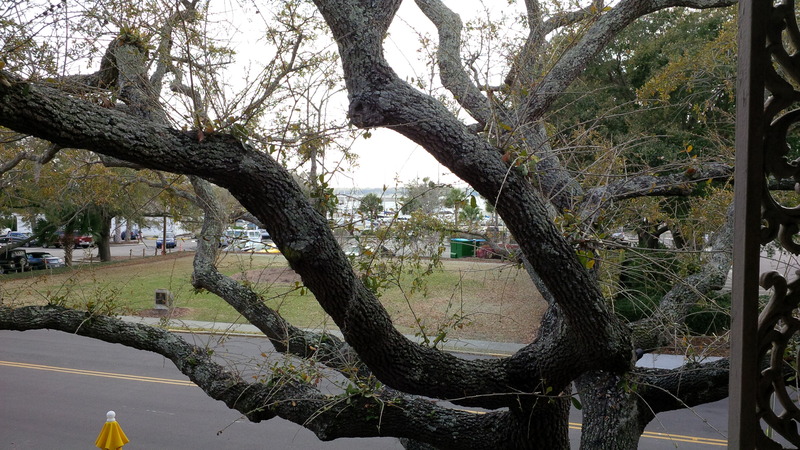 The hotel has 5 of its rooms overlooking Bay ST. Our door opened to a view through the trees of the Beaufort River and the downtown city marina. After two days in Beaufort it was time to pack the motorcycle and head for our next destination in Port Orange, FL near Daytona Beach where we’d be visiting my Dad. I had planned a route that would take us in a south-west direction on state highways before we reached Interstate 95 which we would be using this time. Although we did get some nice scenery on the two lane highway in the low country and crossed the Broad River. It was still quite windy too. There were quite a few times that our heads got tossed around by wind and even began activating the VOX on the intercom. We stopped for gas just north of Brunswick, GA and were also able to take the liners out of our jackets. From there is was all interstate on I-95 into Florida, through Jacksonville and on into Daytona Beach and Port Orange. On both our ride to Beaufort and to Florida it was nice that we could get a late start in the morning and be at our destinations in the mid afternoon. It’s a good thing we didn’t plan on any sight-seeing or riding or riding while in Florida as one day was high winds and rain. But we spent time with my Dad and helped him out with a few things. After a few days in Florida it was time to head back north and in the direction of home. Donna had once again decided that since we would be on the boring highway that she wanted to stop for the night somewhere in south Georgia and then finish the journey home the next day. It also gave me the chance to take her on different route home that she hadn’t ridden on before. I took us up to Ormond Beach where we then used FL HWY 40 to head west to the middle of the state and got on Interstate 75 near Ocala, FL. FL HWY 40 is nice mostly 2 lane highway going through the Osceola National Forest. Our normal trip home would be I-95 to I-295 to I-10 and then I-75 into Georgia and all the way home. The trip on FL HWY 40 takes us up I-95 a very short distance and FL 40 to Ocala and then I-75 all the way home. The mileage of the two routes are nearly identical and the route on FL 40 is about 15 minutes longer but worth every minute of it. Somewhere north of Ocala the odometer on the Magic Carpet rolled over to 80,000 miles too! Again we were dealing with wind strong enough to toss our heads and loud enough to activate the VOX on the intercom. We headed up to our stop in Tifton, Georgia for the night. Although we picked the hotel for its close proximity to being able to walk to any number of restaurants we decided to stay in the room and order pizza to be delivered! Tifton is nearly the half way point for us. So we could once again get a late start in the morning. It also gave us a chance to let the sun warm the day up. Another advantage of Donna’s idea is that it guarantees that we should miss rush hour traffic while going through or around Atlanta. Her way also got us home at just after 1:30 in the afternoon. The Magic Carpet now sits in the garage with more than 80,000 miles on her odometer and she’s ready to go out again! View from our hotel room door overlooking the downtown marina and river. 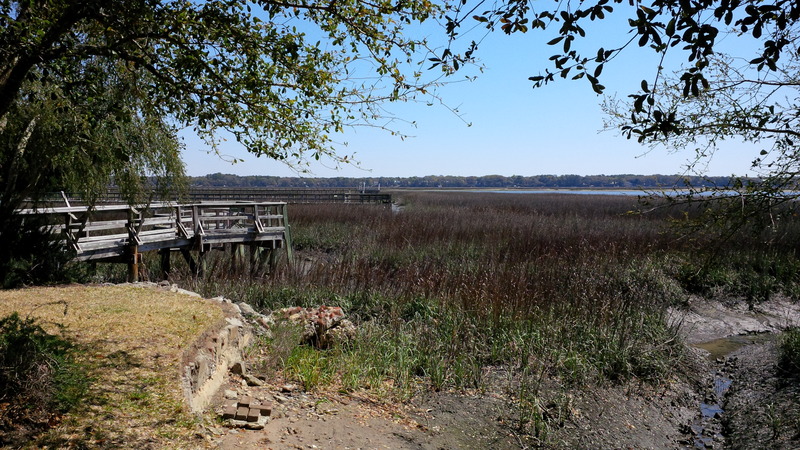 View of the marsh from a dead end street in Beaufort, SC. 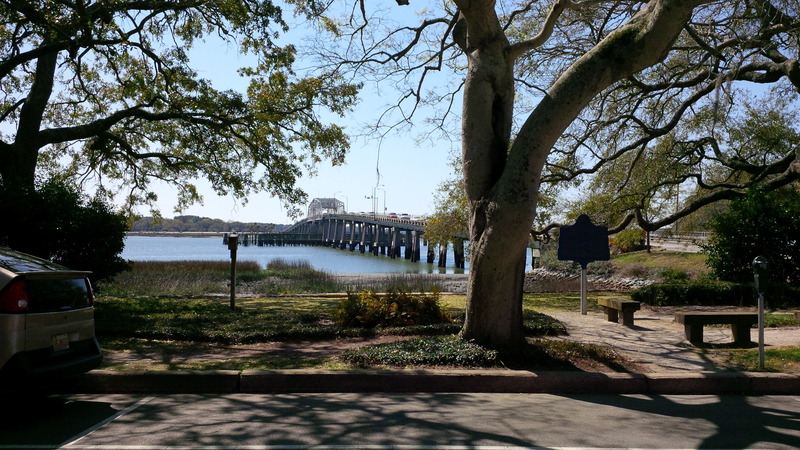 Lady’s Island bridge seen from the residential end of Bay ST in Beaufort, SC. 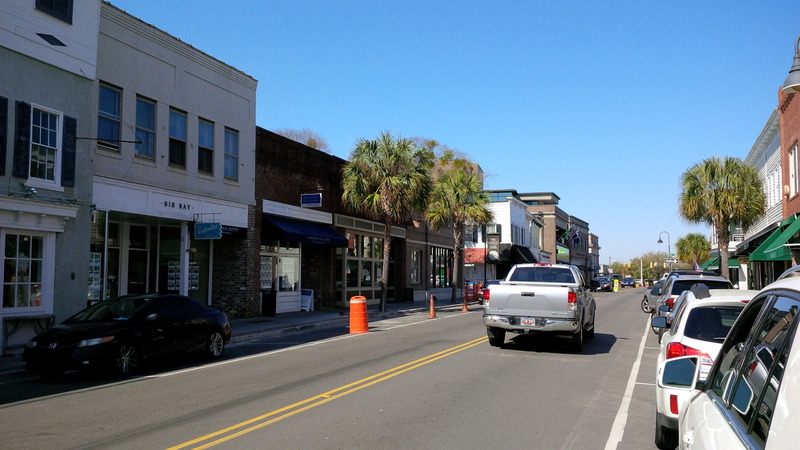 Downtown Beaufort, SC on Bay ST.
Beaufort River bridge to Lady’s Island from the downtown battery park. You can look right through to the Beaufort River. Restaurant sign in Port Orange, FL. Unfortunately is was in the back corner near the dumpster. 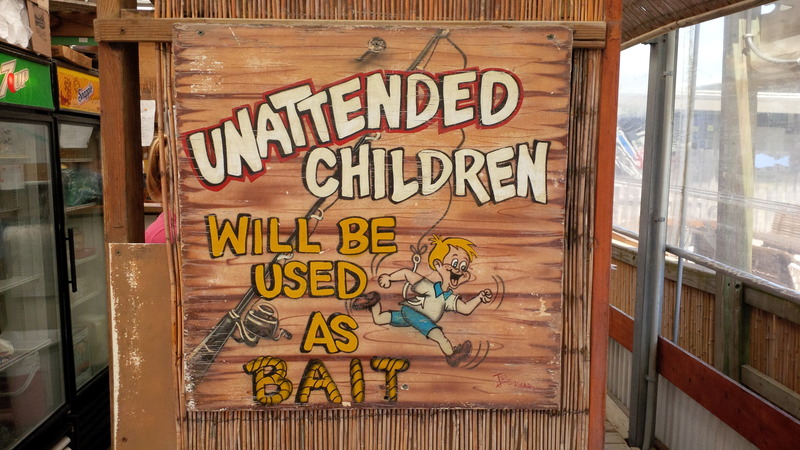 Sign at Boondock’s in Wilbur By The Sea, FL. Lady’s Island bridge seen from battery park. 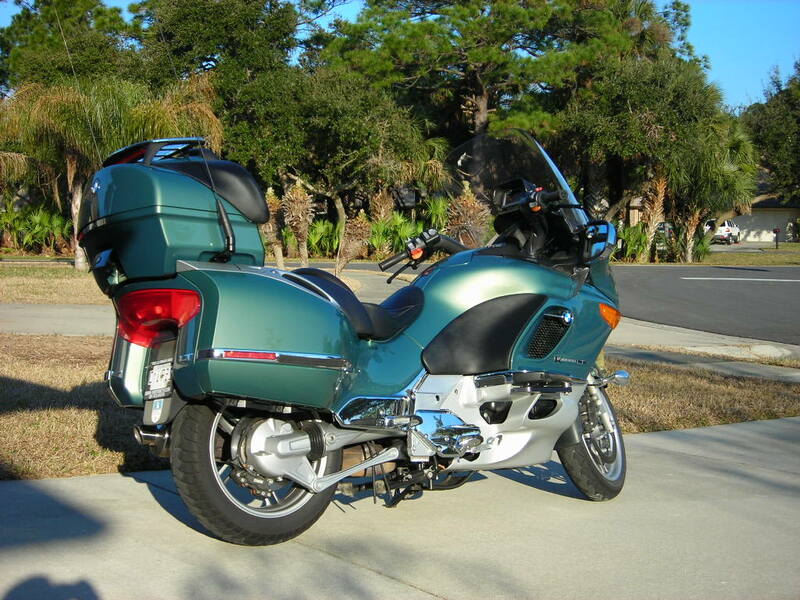 When we replaced our cruiser style motorcycle and bought our BMW K1200LT we did it to travel and take trips. Sure it’s comfortable to ride on all day. 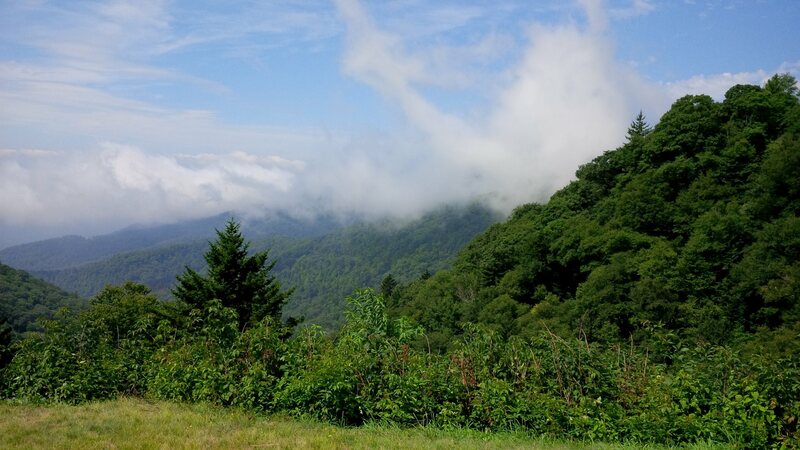 We’ve taken numerous trip to Florida, a number of overnight or weekend trips to North Carolina and we’ve ridden the entire length of the Blue Ridge Parkway. It’s time to ride somewhere again. We had already planned on riding down to Florida to visit my Dad after Bike Week in Daytona Beach had come and gone. Donna started looking for places to go, either on the way to my Dad’s or on the way home. Thoughts she came up with were Bush Gardens in Tampa, one of the Disney resorts or St. Augustine. Then she came up with a possible winner, Beaufort, South Carolina. We’d been to Beaufort a few times, our first right after we got married. 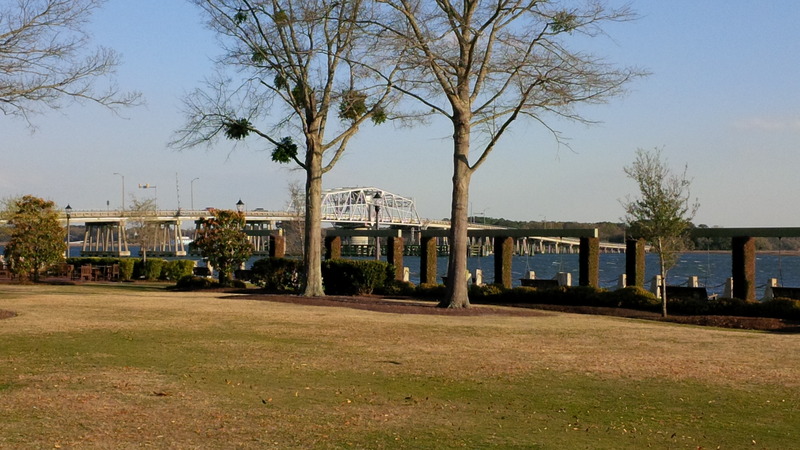 Beaufort is a nice small southern town on the water. We’ve never ridden through the South Carolina Low Country. 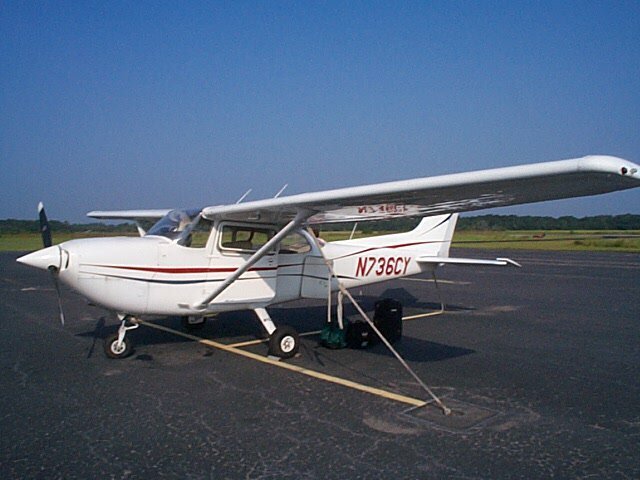 The last time we went to Beaufort we flew there in a Cessna 172XP Hawk. This time we’ll ride. Of course we could take the fastest way, using the interstate, taking I-75 to I-16 and then I-95. But that’s boring and believe me, that stretch of I-16 is extra boring! I’m already looking at a route out I-20 to Augusta then it’s all US and state highways the rest of the way in South Carolina going through towns such as Allendale, Fairfax, Hampton and Yemassee before getting to Beaufort. This more scenic route is only a half hour longer and well worth it. So it looks like a trip to the Low Country is in order before heading for Florida. We’ll have to have Frogmore Stew (also know as Low Country Boil) while we’re there. The last time we went to Beaufort this is how we arrived. I rode back home from Florida today. 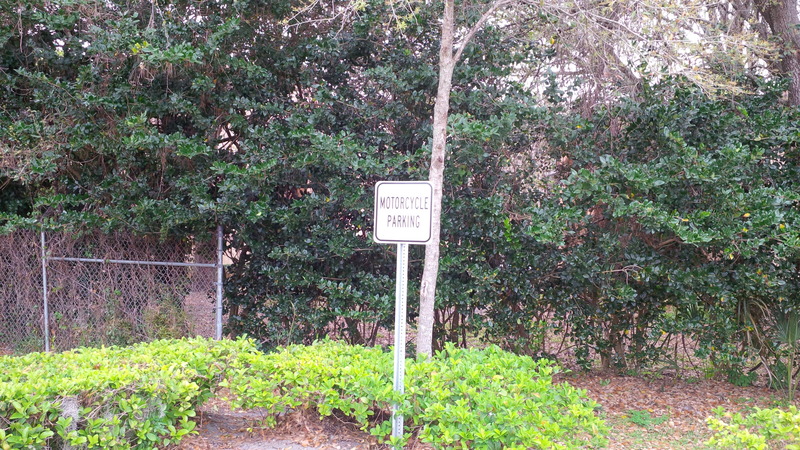 Not long after I got on Interstate 95 I was presented with two examples of “biker or motorcyclist”. A biker can ride any kind of motorcycle and so can a motorcyclist so this has nothing to do with what kind of motorcycles they ride. In fact, today both the biker and the motorcyclist were on the same make of motorcycle. Biker: I was in the center lane and could see a motorcycle slowly coming up in the left lane. As he pulled alongside I noticed right away it was one of the Harley Davidson Hard Candy Customs and had the bobbed rear end, forward controls and mini ape bars. It was actually a gorgeous motorcycle. The rider had on a “pudding bowl” helmet and his feet splayed out. He just had a look that made me think I’d smell his cologne as he passed by. I gave him a wave and he looked over, didn’t wave or acknowledge in any other way than looking. Then he opened up his throttle and pulled away, apparently wanting to let me know that he was a member of the Volusia County Loud Pipes Riding Club. Oh the bars or poker runs that bike has been too! Motorcyclist: It was less than 10 minutes later another motorcycle slowly came up in the left lane. The rider of this motorcycle had on one of those “Captain America” helmets and a worn leather jacket. 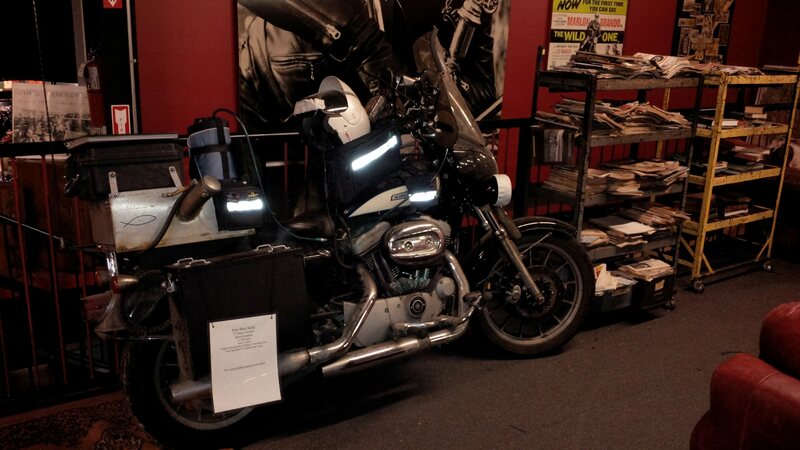 The bike was an older Harley Davidson Electra Glide. This motorcycle had been ridden hard and put up wet many times. You could tell this motorcycle had some miles on it. It looked worn but not abused. It had what looked like a sleeping bag and other luggage lashed to the back seat between its rider and a king tour pack that looked like it was on crooked. Then it happened. As we rode along side by side for just a few seconds, we both waved at each other at the same time and he nodded his head at me. He slowly kept pulling away, maintaining his speed. 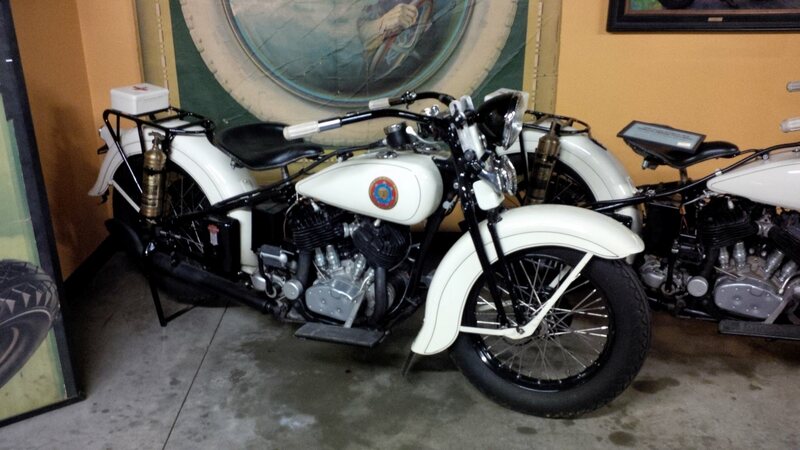 Oh the stories from the road and travels that Electra Glide could likely tell.